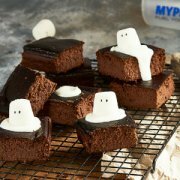 Tuck in to our scarily tasty chocolate brownies this Halloween! 1) Pre heat the oven to 180 degrees C.
2) In a bowl mix together the whey, cacao powder, instant oats, baking powder and xylitol. 3) Add in the egg whites, Greek yoghurt, apple puree and Flavdrops and mix to form a smooth batter. 4) Place in a grease proof tray and bake in the oven for 25 minutes until fully cooked and leave to cool. 5) Once cool cut into 9 slices and mix the Greek yogurt with the Flavdrops. 6) Add a dollop of the vanilla Greek yogurt mixture onto the top of each and top each one with a white marshmallow.